It isn’t often that I come across a piece of Sonics memorabilia that takes me by surprise. I’ve seen – if not all – then very close to all of it, so when I tell you that I found something amazing, well, take my word for it, this is something really unique. I found this particular item from a sale held by Goldin Auctions for the estate of the late Dennis Johnson (the auction is now closed, but you can find the link to the items here). There are the standard jerseys, some signed baseballs from Pete Rose and Ted Williams among others, contracts, a piece of parquet floor from the original Boston Garden, and so on. 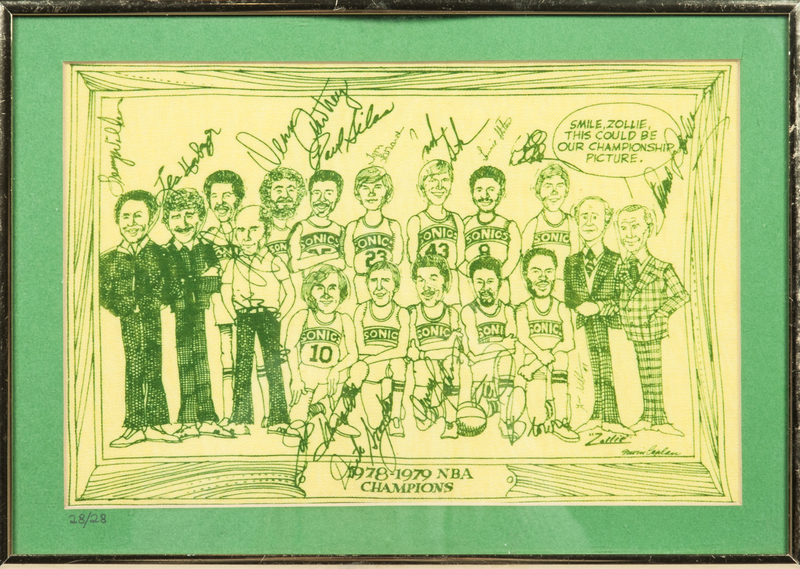 But what caught my eye was this particular gem, a drawing of the 1978-79 Seattle SuperSonics (click to enlarge). It’s wonderful on many levels. 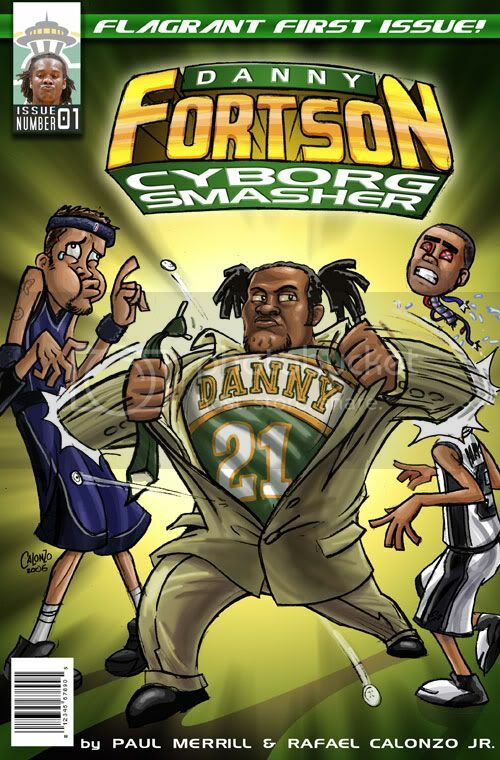 You’ve got the autographs of all the players, the one-liner from Sam Schulman, and, most importantly, the utterly fantastic drawings of all the players and coaches. Just knowing that this was something given to each of the players (I would assume, anyway) makes it even more special. I have to imagine there are a handful of these still in existence, and it’s possible the team reproduced them for select season-ticket holders, advertisers, etc. That said, in the bottom left corner is a marking indicating this piece was 28 of 28, which obviously means not a large number of them were made. Still, it’s something I’d never seen before, and thought was just really exciting to come across. (Also, I was glad to see that Dennis Awtrey was captured in full beard - unlike the team photo that shows him shaven). You may be wondering – as I was – who the creator of the piece is. If you look closely in the bottom right-hand corner, you’ll see an inscription that shows up as (indecipherable) Caplan, which has to make the artist Irwin “Cap” Caplan. Caplan isn’t perhaps familiar to most people, but he is a native Seattlite who went on to fame as a cartoonist with the Saturday Evening Post, Colliers, and Life, and many others. After a long and noted career that included art exhibits at the Seattle Art Gallery, the Metropolitan Art Gallery in New York, and the National Gallery in Washington, Caplan passed away in 2007 (you can read a nicely written piece on his life from the Seattle Times here). It’s hard to say how Caplan came to draw this piece – it’s entirely possible that Caplan was a season-ticket holder, or perhaps just a friend of people that worked with the team. 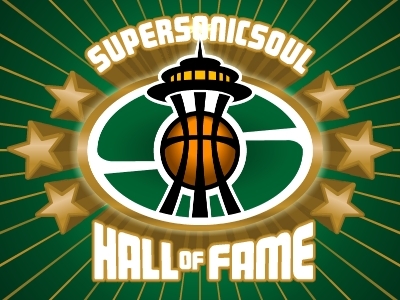 If nothing else, it just further cements just how beloved the Sonics were in Seattle in 1979.